This exhibition surprises in many ways. Firstly in contrast to the rest of the exhibitions that are on display which look very ordered, defined and mainly in brightly lit glass cases, the disobedient objects exhibition is placed on one side of the museum and as you enter, it feels as if you have arrived in your worst nightmare. The exhibits look disorganised and a mix and match of items that do not look as if they belong in the same place. The silver bars going from floor to ceiling looked as if the objects were imprisoned. I was confused on first look but as I read the text on each exhibit I finally understood what this exhibition was about and was fascinated by the politics, history and the struggles of people trying to bring about change in various situations and making their voices heard using objects to put their points across. 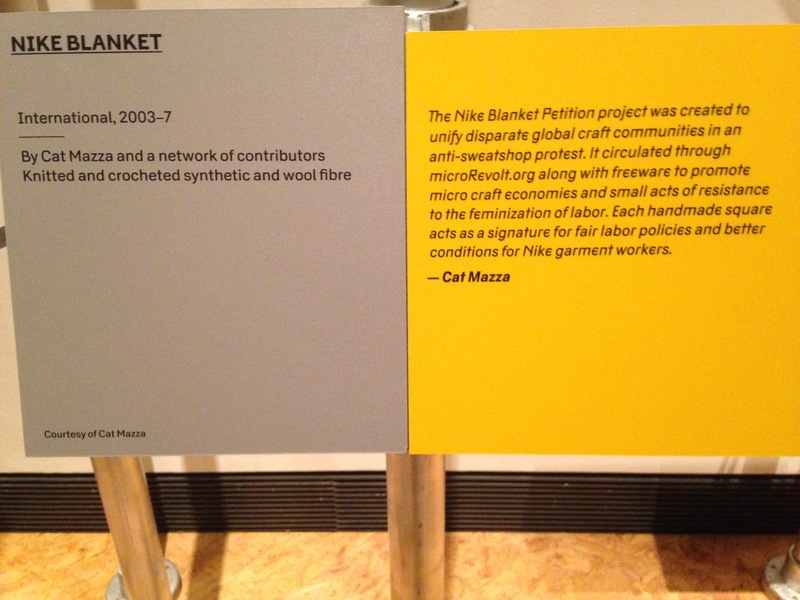 The Nike blanket exhibit was a protest against cheap labour used for Nike garments. It was placed on the wall quite high and though the blanket in its size and colour made an impact to understand the protest, its position was hard to notice. The text was placed nearer eye level and therefore you know that there is an exhibit somewhere. Another exhibit celebrated solidarity. It was a mix of slogans, logos, printed t-shirts, leaflets and more. 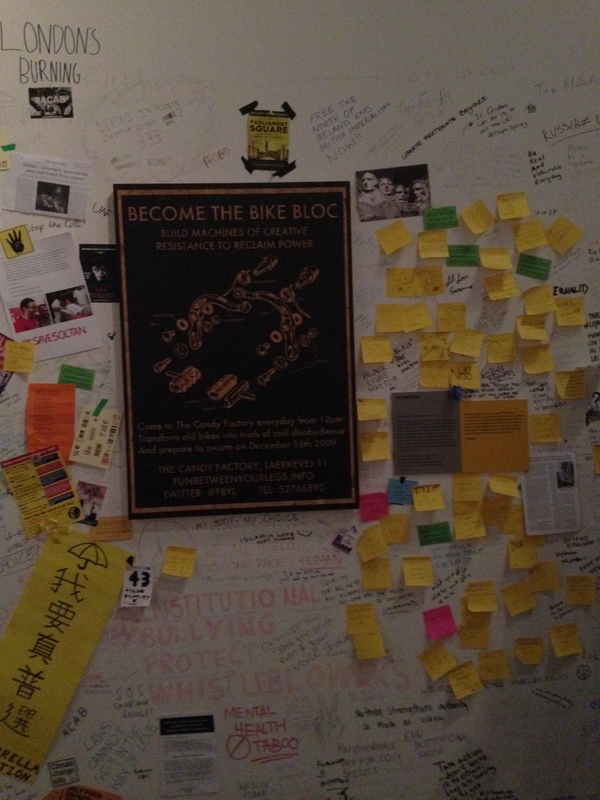 I was astounded with the amount of things on display and the strong messages that scream from the walls. 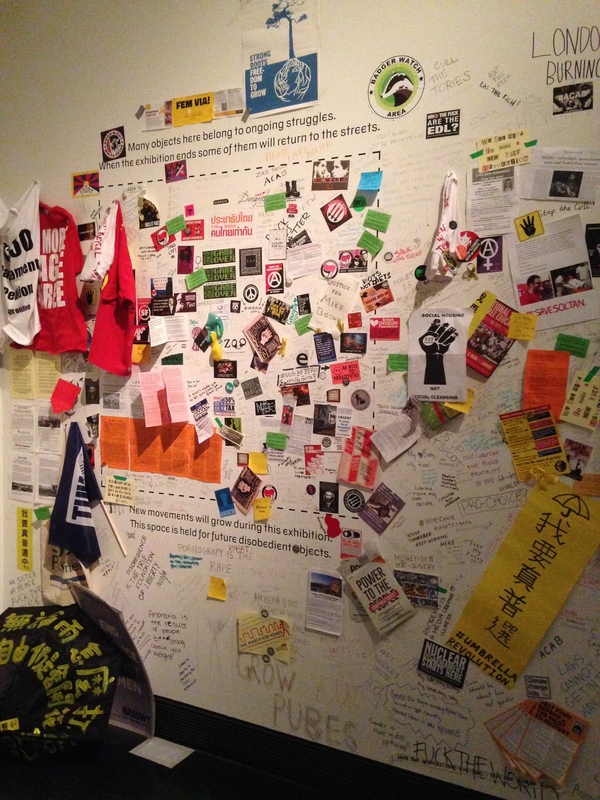 The display is a muddle of objects but because of this muddle you are captivated by it and feel like “sticking together” with the people of these struggles. Going through each object you feel more and more like you are part of each struggle. They have a strong impact on you and when you come out of the disobedient objects exhibition back into the orderly structure of the museum you feel exhausted but inspired to look for the next struggle and play a part in its movement. From a Suffragette tea service to protest robots, this exhibition is the first to examine the powerful role of objects in movements for social change. It demonstrates how political activism drives a wealth of design ingenuity and collective creativity that defy standard definitions of art and design. 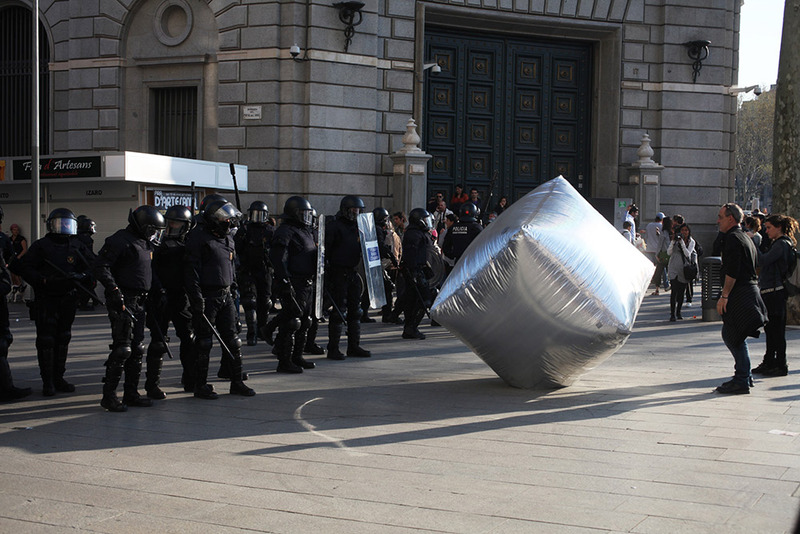 Disobedient Objects focuses on the period from the late 1970s to now, a time that has brought new technologies and political challenges. On display are arts of rebellion from around the world that illuminate the role of making in grassroots movements for social change: finely woven banners; defaced currency; changing designs for barricades and blockades; political video games; an inflatable general assembly to facilitate consensus decision-making; experimental activist-bicycles; and textiles bearing witness to political murders. This entry was posted in Digital Arts Process on January 11, 2015 by saadchaudhryme. Burning desire is a glass print photograph of five images that are dressed in religious clothes. They seem to be worshipping in a desert with four of the figures dressed similarly and each engulfed in flames. 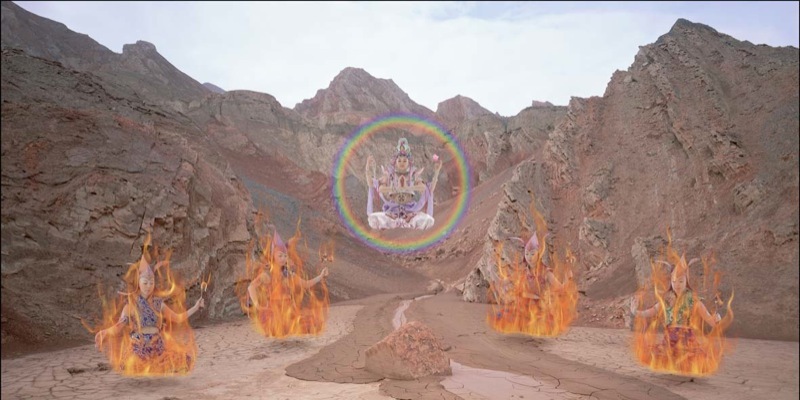 Why are they sitting and worshipping and above all why is one figure raised and floating above the others not in flames but wearing clothes that look like she is a goddess and has a ring of rainbow around her? This image goes back to the artists strong religious and Japanese background. It shows peoples strength in their faith and religion that even in flames they are sitting calmly as Buddhism is a religion for your soul and is known for its peace and tranquility. The burning figures seem to be worshipping to the floating goddess that they aspire to become. The flaming figures could represent the journey to “nirvana” which is the highest state a person can attain after burning away all their human desires. This art work is Mori’s vision of reaching paradise, therefore the image of the pure goddess type figure with the halo of colours above and after burning away your desires and sins in this world. On the other hand if you view this piece without knowledge of the artist it can be seen that if you commit evil you will burn forever in flames but if you are good in life you will rise to heaven. The image is taken in an isolated desert as if judgement is going to be passed on their life and either they will be risen or explode in flames. The image is printed on five large glass panels which creates a huge cinema like image. You feel totally immersed in the image and it feels as if you are also going to be judged. This entry was posted in Digital Arts Process on January 3, 2015 by saadchaudhryme. 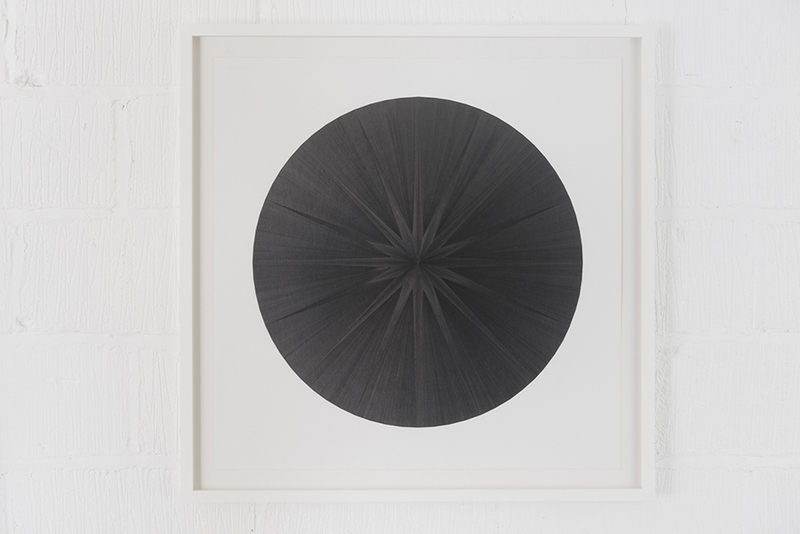 Mohammed Qasim Ashfaqs art piece Black Hole III, 2012-2013 is simple in its design and colour and on initial view looks like a circle simply coloured black. However close up you become astounded at the hundreds of detailed precise lines and dark tones that seem to create a star from out of this world. The design of the lines as they disappear into a central vanishing point makes the viewer feel as if they are being swallowed up by a black hole fulfilling the desire of the artist as the title of this piece shows. 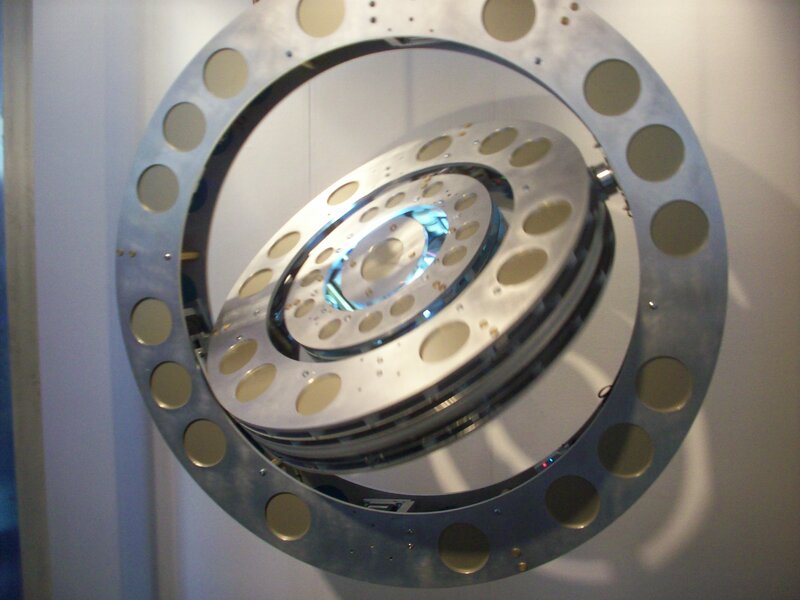 Ashfaq artworks are inspired by his interest in space and science fiction and are very exact and precise in nature. This perfection is opposite to the chaos of the real world and as you view the Black Hole you become curious as to what life could hold in an orderly and disciplined world as the precise nature and perfection of the art piece demonstrates. On further inspection and by looking at the work from different angles the shades and tones of the art changes very slightly and you really do feel as if you are falling through a hole and may or may not land at some destination. The first impression of the Black Hole is of peace and tranquility as all you see is a round black circle but as you take your time over the piece the hole takes on a life of its own and seems to be moving ever so slowly through space swallowing up everyone who dares to take their time staring at the Black hole. 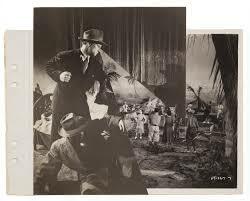 John Stezakers photo montages are created from photos of Hollywood stills and seem to create a story within a story. 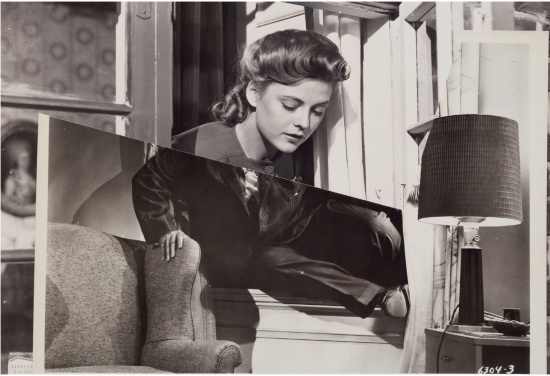 They are not just two photos put together for the sake of art but the photo montages feel as if it is the original photo. The photos are cut using what seems like a surgeons knife and cut with straight angular lines. They are easy on the eye and without any thought process it is easy to interpret the photo montages. 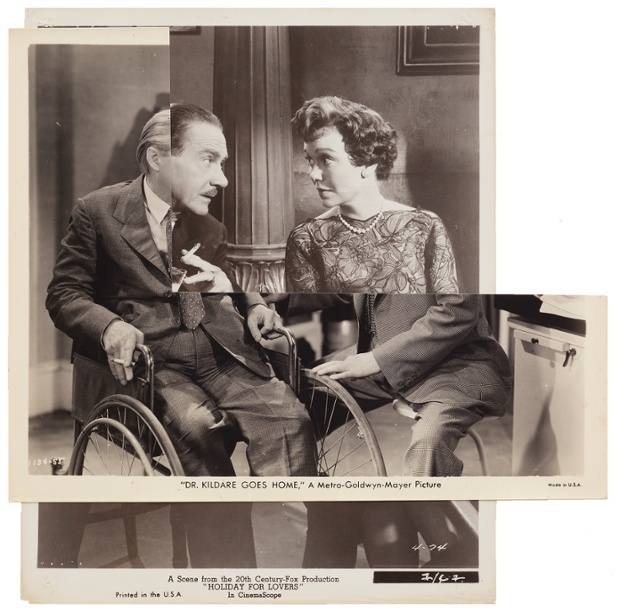 Stezaker has a number of photo montages on display and the way he decides which photos should become part of one photo montage shows the sense of humour of the artist. Each montage is amusing, entertaining and very clever. Choosing black and white photos also enhances the mystery surrounding the originality of the photo as much of the audience today will be unaware of the films these stills are taken from. Also by using black and white photos the photo montages are sharp and distinctive and feel they have more of a story to tell than simply a photo stuck on the wall. Stezakers work is one of the easier pieces on the eye at Mirrorcity and definitely easier to interpret. Placed in one horizontal line on a white background you become immersed in the work and feel there should be many more montages on display for the audience to appreciate and be further entertained. This entry was posted in Digital Arts Process on January 1, 2015 by saadchaudhryme. 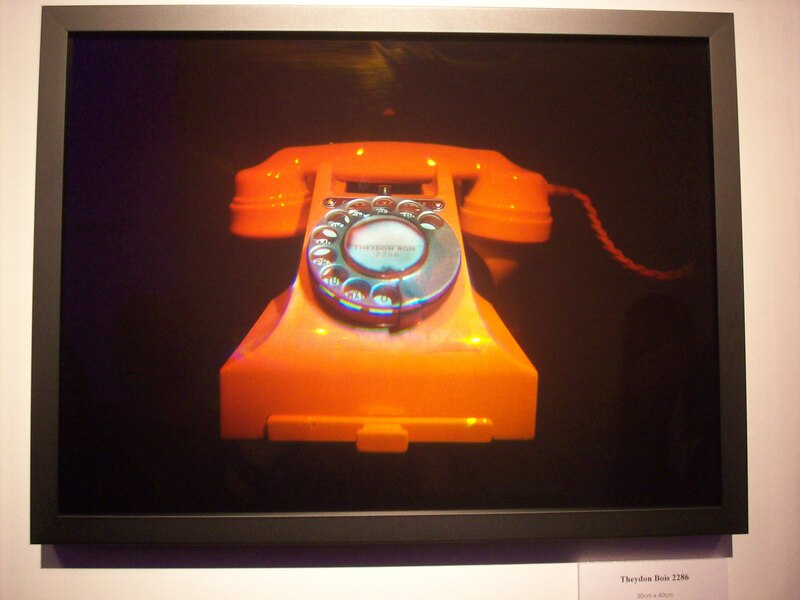 I went to the Kinetica art fair at the Old Truman Brewery on Friday 17th October 2014 and it was very interesting and all about the digital stuff. 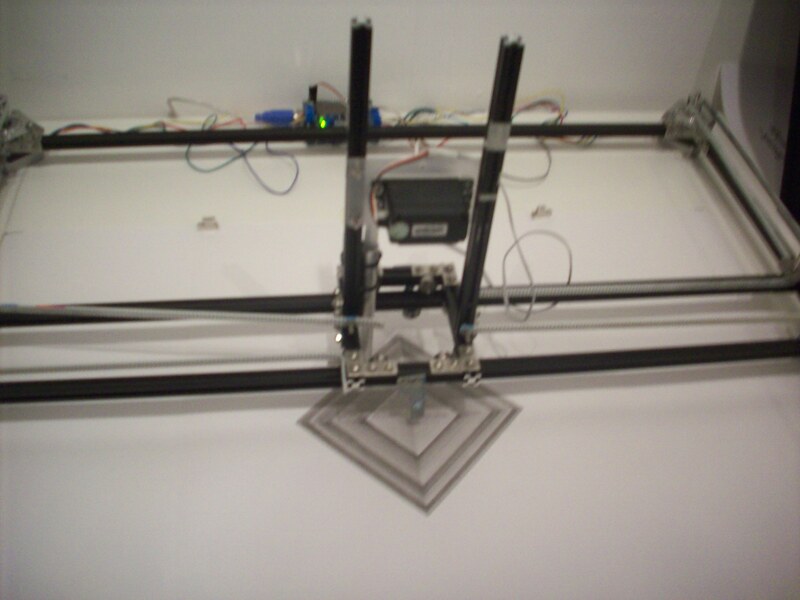 It combines the new arts, science and technology and as the name suggests is all about movement. 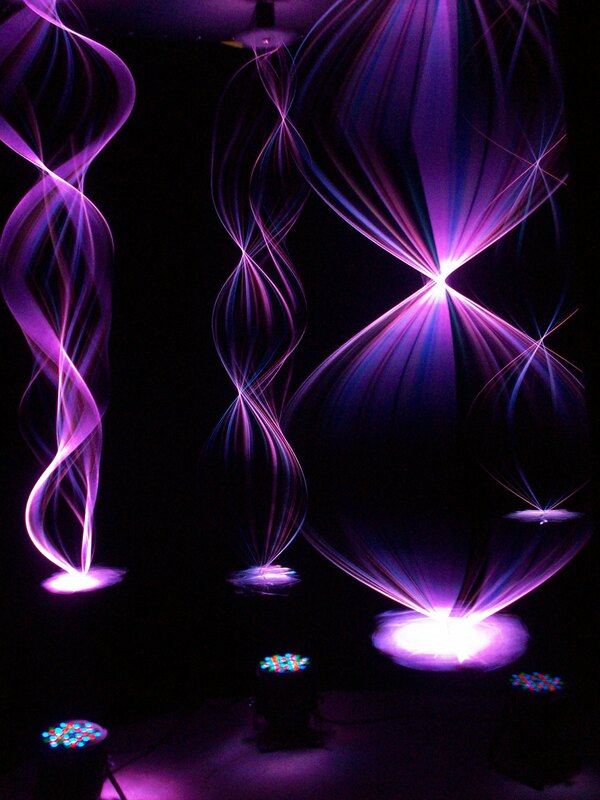 On display were fascinating artworks like interactive holograms, 3D projections, hanging mobiles, kinetic sculptures and light shows. The artists were from around the world. The exhibition was a mix of everything and there did not seem to be any narrative as you walked through. Depending on the artwork some areas were well lit and other areas quite dark. It was a mix that made all your senses feel alive. Definitely an exhibition that visually makes you feel you are in a kaleidoscope being shaken around from all sides! This entry was posted in Digital Arts Process on October 30, 2014 by saadchaudhryme. I went to the Art of The Brick Exhibition at the Old Truman Brewery on Thursday 16th October and it was very exhilarating and inspiring viewing the creations made just with plastic bricks. Who would have thought the blocks I played with as a child could be turned into beautiful pieces of artwork. 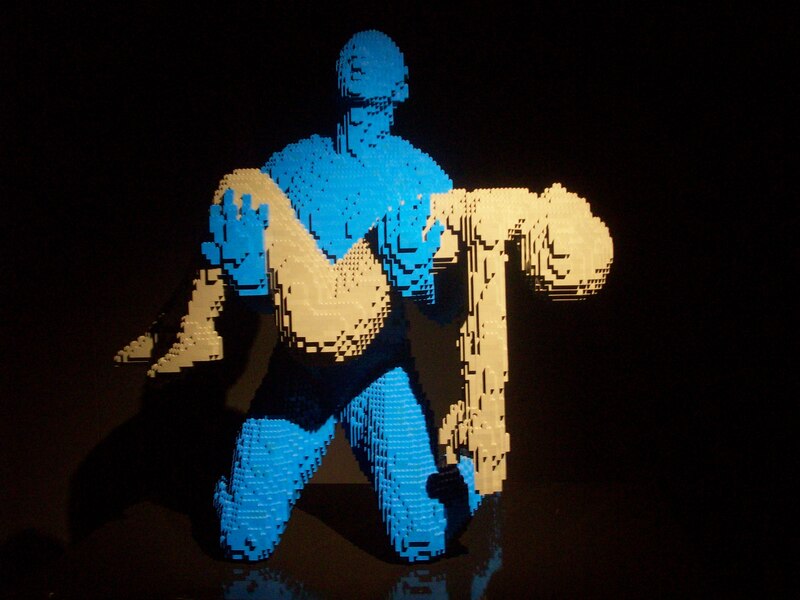 Art of The Brick Exhibition is all about lego 3d sculptures created with thousands and thousands of bricks of lego. 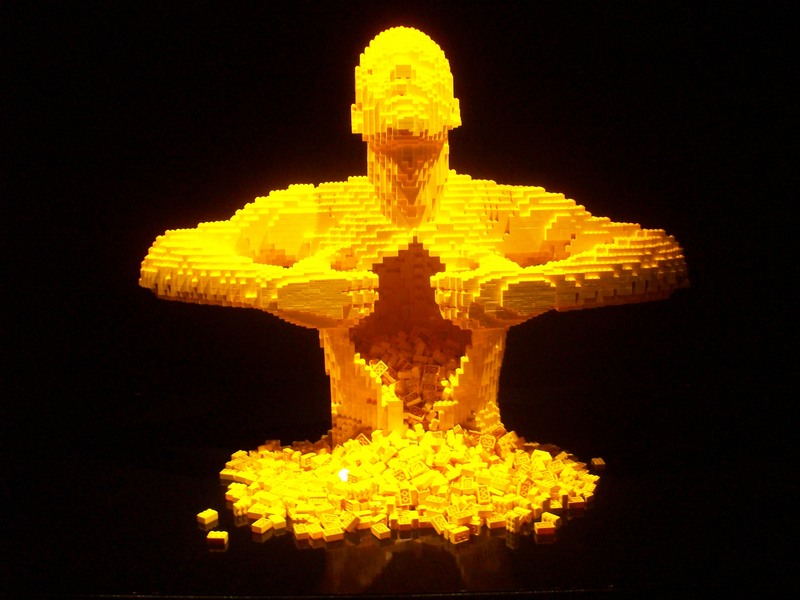 An American artist, Nathan Sawaya is the brilliant and artistic creator of these jaw dropping creations. He created 3D models of people, portrait images, animals, objects, food, the environment, sports, planets, etc. and everything is mind boggling. The artworks are placed on different stands and some similar pieces are grouped together. The area was dimly lit and had spotlights directed on each piece, however the sculptures are not so easily viewed. You want to see each brick gone into making them but I think because the bricks are brightly coloured the curators have gone with the darkness. The exhibition evokes a lot of emotions as you can be happy viewing some pieces and then there is a piece of a man holding a dead woman. It is definitely a roller coast of emotions! 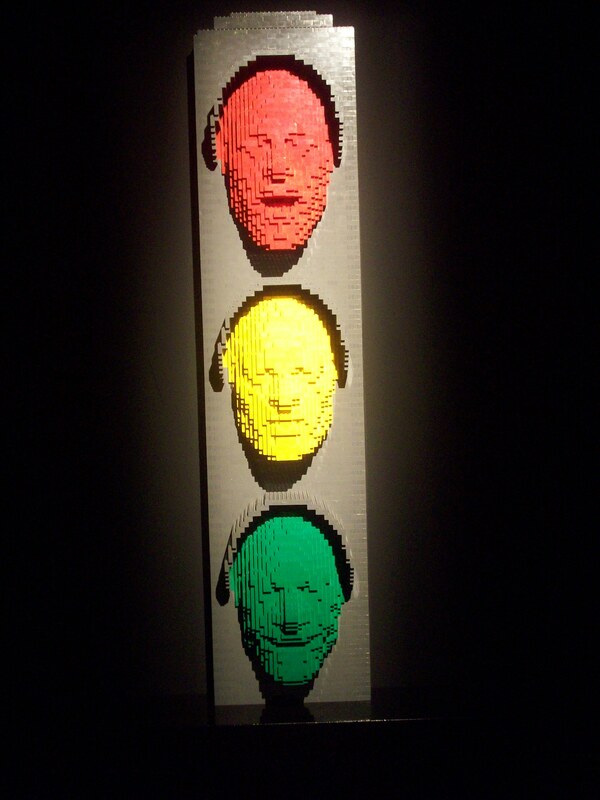 I feel like getting out my lego again! This exhibition is definitely worth the ticket price and appeals to all age groups. 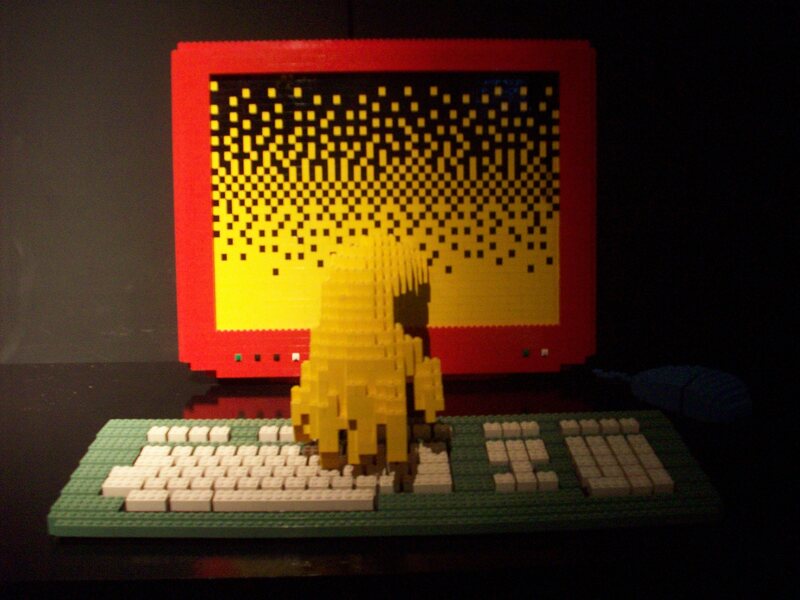 Excited to see what pieces of artwork the artist will create next with lego…. 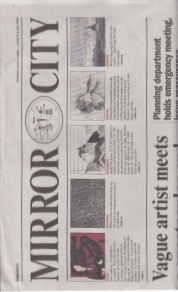 “MIRROR CITY” explores the effect the digital revolution has had on our experiences” This is the tag line for this exhibition. This exhibition is at the Hayward Gallery on the Southbank and showcasing new artists. 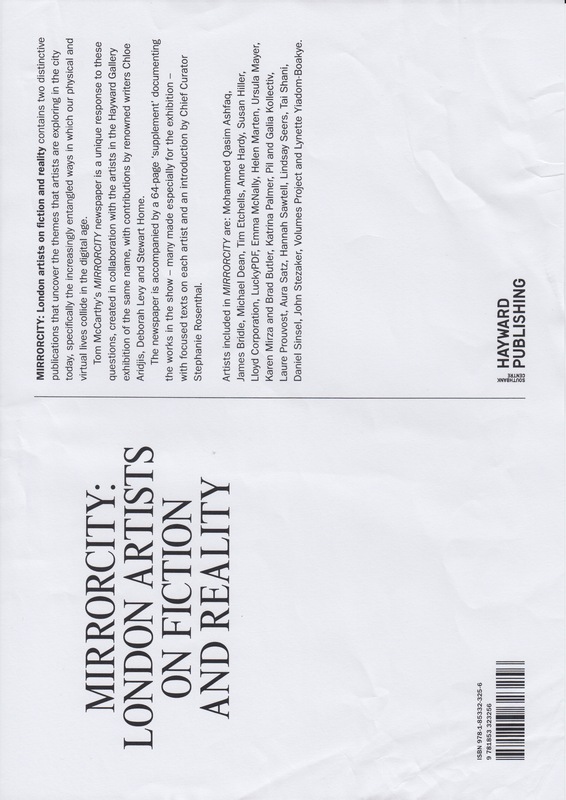 The artists exhibiting believe reality, science fiction and the digital age have combined to create this Mirrorcity, therefore an imaginery space what they believe is the London of today. Even this description is quite confusing and complex as was the exhibition. You have to leave any pre-conceived ideas about the artwork outside the exhibition and walk in and really let the works take over you otherwise you will feel lost and wonder what has hit all your senses. The space inside the gallery was huge and brightly lit. The art works were placed at great distances from each other and because of this it felt like there were some pieces missing. Artworks included paintings, film and video, sculptures, drawing, sound and performance. The walls were white and the captions were also written on white backgrounds with black text. These were easy enough to read but the text was lengthy without giving enough information about the artist or clear understanding of the idea behind the works. At the time of my visit there were around 100 visitors and most of them as I watched them had a confused and bewildered expression on their faces. There were a few mumbles as people were trying to decipher the art pieces. Some artworks were performances or films. Headphones were required for this. The videos ranged from 15-30 minutes and apart from one show I did not see anyone stay for the full duration of the shows. Some spectators did not even bother with the headphones. These shows were not like watching a film down at your local cinema but required an understanding of the piece on a completely different level and also the patience to remain interested. As a deaf person I really struggled with the headphones and of course there were no sub-titles. Normally I just about get the idea about what I am watching even if I can not understand the speech but these performances were beyond understanding as a visual alone, I suppose these were like bad dreams that you try to figure out when you awake. 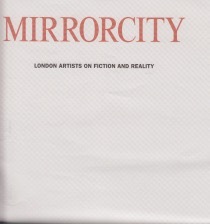 This exhibition claims to be about “the shifting, complex and multi-faceted nature of London itself” which it does as London is a very mixed, confusing and complex city which changes all the time but I felt it was more negative than positive in its representation of the city. 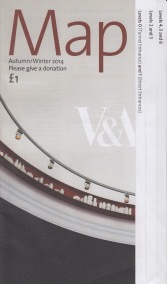 Would I recommend the exhibition? Yes if you like to be confused and enjoy mayhem and No if you want an easy life. The choice is yours!